Plans to breathe new life in to Ayr's historic town centre are now officially underway. Contractors have moved onto the site on the town's High Street as they prepare a number of buildings for demolition, paving the way towards the construction of a new Riverside Block. Since 2013 Ayr Renaissance has been acquiring the properties on the Riverside block - the area of vacant properties around the former Woolworths building. This process was completed in 2016 and a master plan for its redevelopment formed. This masterplan was approved by South Ayrshire Council last week giving the green-light for demolition to commence. The masterplan sets a vision for a high quality mixed-use development including quality office accommodation as well as space for niche retail units, cafes, restaurants and public engagement. The plan sets out a commitment to top quality design sympathetic to existing historic buildings and the surrounding conservation area. The demolition contract has been awarded, after an open tendering process, to George Beattie Ltd of Kilsyth. It is a 40 week contract and includes provision for archaeological investigations to be carried out by Rathmell Archaeology. The demolition contract involves the removal of all internal fixtures and fittings, followed by the demolition of all structures with the removal of all debris off site. This will be carried out under the watchful eye of our archaeologists who will ensure anything of historical interest will be identified and recorded. Once the buildings are cleared a series of trenches will be dug across the site to allow further investigation, ensuring anything of archaeological interest is identified and recorded. James Knox, Chair of Ayr Renaissance said, "We've waited a long time for this day, and I am delighted to see the contractor on site, beginning the preparations for demolition within hours of South Ayrshire Council granting planning consent. "This is a very complex site to work on; however, we are determined to make progress as fast as possibly so the people of Ayr will see the river from the High Street for the first time in generations. "We're very excited at the prospect of an archaeological dig which will explore this historic part of Ayr that has lain under concrete for many years." Bill McIntosh, Leader of South Ayrshire Council and AR board member said, "With the hoardings up and work now getting underway I'm proud to be here to mark the first significant milestone for this ambitious project. "These positive steps will pave the way to a bustling new quarter in Ayr's historic town centre, breathing new life into the area and bringing people back to the riverside. 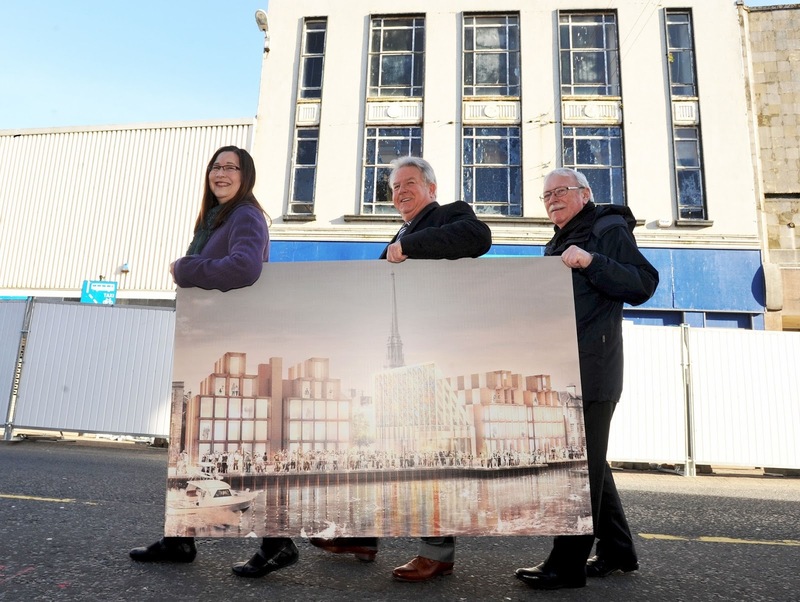 "Locals and visitors alike will soon see visible signs of progress as the old buildings come down, with the Council's flagship office accommodation project helping to kick-start regeneration plans and bringing benefits to the wider South Ayrshire economy."